Canon USA Inc. have launched 11 new monochrome machines! They are updating the imageClass series. Two copiers, five printers and four multifunctions are planned for May. These machines are aimed at homeworkers and small- and medium-sized enterprises. "Whether an employee of a corporation, or an individual in a home office, users require intuitive devices that will work as hard as they do. This expansion of the imageCLASS portfolio offers professionals user-friendly devices that provide in-demand features for the fast-paced, modern workplace," said Toyotsugu Kuwamura, vice president of Business Imaging Solutions Group, Canon USA Inc. These machines are characterized by their wireless connectivity, by enhanced compatibility with Apple and Android mobile devices, and wby compatibility with Mopria Print Service and Google Cloud Print. The printing speed of printers and LBP 351dn 352dn make them the fastest machines in the US market. They can print at 58 to 65 ppm. Also, the total paper capacity is now 3600 pages, and toner capacity has been upgraded to 11 000 pages as standard and 25 000 for high-capacity cartridges. 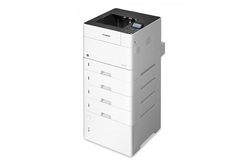 Finally, the MF419dw and 515dw MFPs and the LBP253dw, 351dn and 352dn printers are now compatible with uniFlow. Find more information soon on Your DMO!